I stopped using a microwave maybe 15 years ago. I actually use my RV microwave as a storage cabinet. I'll take extra storage over soft, soggy vegetables any day! The more alive/raw your food is (I'm talking about plants here), in it's most natural state, the better tasting and better for you it is. Cooking your veggies in a microwave kills all of their nutritional value as well as flavor. That goes for boiling your vegetables as too, with some exceptions, such as potatoes. I don't care what the package says! If they can be eaten raw, they don't need to be boiled or nuked. For leafy greens, such as spinach or kale: Start fresh. Avoid buying frozen greens, if you can. If you don't want to eat them raw, cook only until they just wilt. Sometimes this means less than a minute. If they're going in a soup, you might want to even put a handful of them raw, in the bowl. Ladle the cooked soup over them. Stir until they wilt. For delicious raw kale: Remove the vein and massage the leafy part until it's softer and appears darker and somewhat wilted. This takes away the bitterness. For asparagus, brussel sprouts, carrots, broccoli, green beans: Again if not eating raw, sauté or roast in the oven, but test for doneness when they still have they're most vibrant color. If the vegetables pale, they are over-cooked. Never boil. For all veggies: Don't be afraid to season! A little salt, pepper, and garlic powder is my favorite combination, for most vegetable dishes. This is a very fast and easy dish that is a staple for us. Because it is served cold, it is a great dish to take to work or on the go, for lunch. Combining raw and cooked ingredients, it is an excellent balance of flavors and raw nutrients for your body. 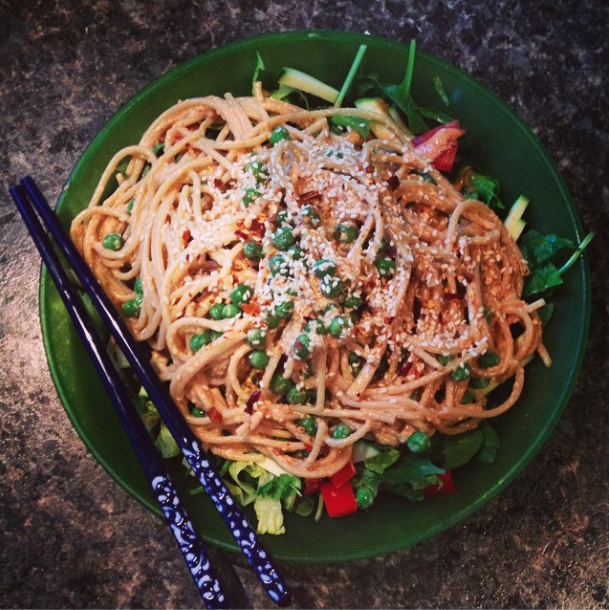 Sesame Peanut Noodles are great to take on the go, because they are served cold. In a food processor, process peanut butter, liquid aminos, water, vinegar, lime juice and zest, onion, ginger, sriracha, sugar, and red pepper flakes. Cook noodles according to package instructions. Once tender, drain and rinse with cold water until completely cool. Toss with sauce until fully coated. Garnish with carrot, cucumber, sesame seeds, and peanuts. Serve cold. If you don't want the extra kick from the sriracha sauce, replace sriracha with another tbsp unrefined sugar. At this point I think we all know how much I love spicy food. For some reason my stomach can't handle a mild pepper at all. I eat one bite of an innocent little bell pepper and I'm doubled over in pain for hours (some kind of sick joke being played on me?). But if the pepper is so hot it makes you tear up or better yet, go numb, my body can handle it, no problem. What's up with that? Remind me, because I do have a recipe for a stuffed bell pepper that is so good it's worth it to me to be in severe pain….sweet delicious pain. In the meantime I shouldn't deny you my homemade fresh hot sauce recipe, which I put in oh, just about everything. I want you to embrace the spicy in yourself. You can handle it. I believe in you. Aaaand as an extra bonus, I also should not deny you the recipe for my favorite homemade spicy cocktail, because you've worked so hard on learning to love the spicy heat. You deserve it. Process until pureed. Store in the refrigerator in a jar with lid up to 4-6 weeks. *For a completely raw hot sauce, replace vinegar with raw apple cider vinegar, and use fresh cayenne. Stir and garnish with whatever you please! Garnish ideas include: wedge of lime/lemon, olives, celery, strip of cucumber, caper berry, or all of the above. 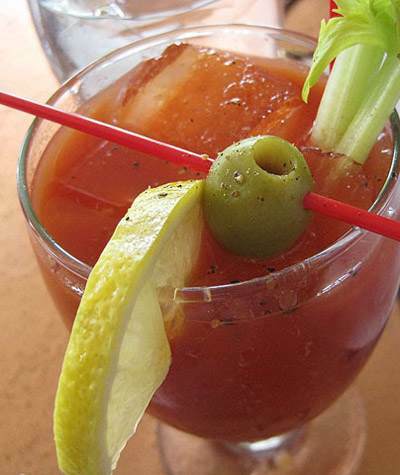 * For those of you who want the bloody mary without the heat (I admit, I'm slightly disappointed...but I guess you must have tried), definitely omit the chipotle powder and ease up on the hot sauce. Ah, Southern California Desert. This is a great spot for winter RVing. There are palm trees, mountains, and warm days. The Coachella Valley has lots of RV parks to chose from, and endless hotels and resorts for the winter vacationer without an RV. Of course, it is directly on the San Andreas Fault which is scary, buuuut nobody's perfect. Sean and I decided to stop here to try and find some work at one of the resorts. The season is just getting started here, so we're hoping it will be an easy transition. We also have Joshua Tree National Park nearby which is a rock climber's paradise, so we will have lots of fun while we're not working. While we are looking for work and getting to know the new neighborhood, I have also been busy trying new things like sprouting grains like wheatgrass, and making homemade probiotics like rejuvelac. I don't usually have much of a green thumb, but I always like to try something new. Besides, sprouting a seed is alot easier than keeping that bad boy alive for an extended period of time! I took a big gulp of the rejuvelac this morning and I had an immediate incredible burst of energy. This energized feeling lasted the whole day and evening. It's absolutely amazing. I will get into this more after I do a little more research about it. It's still new to me, and I don't want to misinform anyone. But as of now, I feel great from drinking it, and I'm thinking of continuing to make it regularly. Another thing I notice in this part of California, is the abundance of citrus trees here. It seems that everyone has their own citrus tree in their yard and it is in season here right now! It's really quite beautiful. It makes me want to eat something tropical. The other day I happened to find a great looking organic pineapple and... I was inspired. This recipe is for those who are not afraid of some spicy heat! The jerk sauce also makes a great marinade for tofu or seitan and can easily be applied in other dishes. In a large pot, start boiling water for the pasta. While waiting for water to boil, in a large frying pan add cauliflower, onion, and ½ the jerk sauce over medium high heat. When water boils add pasta and cook until al dente. Once pasta is added, add remaining ingredients to frying pan as well as second half of the jerk sauce. Turn the heat up to high. When pasta is done, strain and put back in the large pot. Stir in the veggies and jerk sauce mixture. Serve hot. *For a gluten free version, use rice noodles, rice, or quinoa instead of the pasta, and liquid aminos instead of soy sauce. And just like that I'm back in Phoenix, AZ with my beloved Pioneer. It's been 2 months without it and I'm so happy to be back. I know I know full-time RVing is associated with the retired, the seniors, the old man with a passion for barbecuing and maybe his wife and all her little dogs, and love of games like bridge and Mah-Jongg. Maybe not so much the active, still working, rock climber, vegetable loving couple in their 30's. But you know, Sean and I really never once dreamed of a house and a picket fence. We never felt comfortable in one place, where we could settle down. We don't care if we ever have a career, in fact, we prefer not to. An ideal situation for us is to work seasonally, live simply, and travel often. Play outside, see beautiful places. Eat tasty things. " A glass of wine, a crust of bread, and a view. What more could you ask for?" (Anthony Bordain said that.) I couldn't agree more. Well we are living our dream right now. Back out west where the sky is so blue it's almost purple, and the humidity is a distant memory. It is no longer a battle between my hair, and the moisture in the air! My hair has yet to win that battle. I can't wait to find out what is next for us! I think a celebratory snack is in order. Black bean salsa and chips. Mine has liquid smoke in it, which is a condiment I use all the time for a nice hickory flavor. It is not at all spicy, just smokey. You can find it in the bbq sauce section at the grocery store. It's around $2. Mix it all together to combine. Add more liquid smoke & salt if needed, and mix again.